The annual Committee for Montgomery legislative breakfast was held this morning at the Bethesda Marriott of North Bethesda, featuring eight Democratic gubernatorial candidates – Prince George’s County Executive Rushern Baker, Baltimore County Executive Kevin Kamenetz, former NAACP chief Ben Jealous, state Sen. Rich Madaleno, policy consultant Dr. Maya Rockeymoore-Cummings, former policy director to First Lady Michelle Obama Krishanti Vignarajah and former Obama official and tech entrepreneur Alec Ross – who each participated in a 45-minute candidate forum. 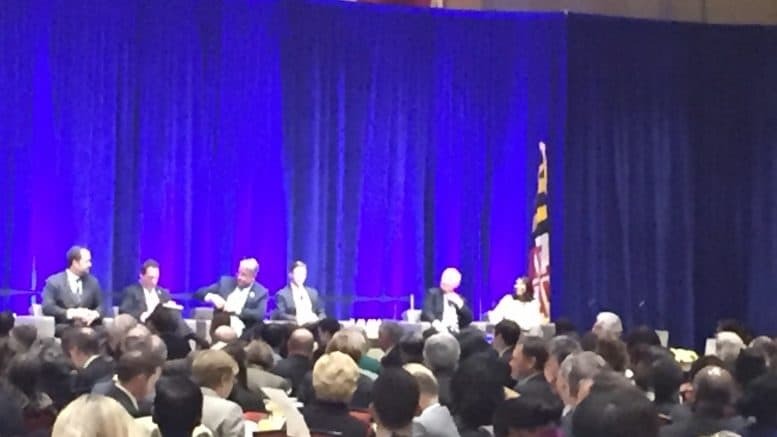 Maryland Matters co-founder and editor Josh Kurtz moderated the gubernatorial forum. Gov. Larry Hogan was invited but declined to attend. Committee for Montgomery, according to its website, is a broad coalition of community leaders that advocates to the Maryland State Government for Montgomery County’s needs through collective action. A Miner Detail has exclusive (shaky) video (apologies).